Re-purposed Wauseon Fire Department 1988 Spartan fire truck. In past decades, funds were raised from the Fireman’s Association to purchase needed Wauseon Fire Department equipment. But as the price of vehicles outpaced available donated funds, purchasing switched to the reality of a government model. The new reality is refurbishing fire engines. Just as the technology has evolved, so has the price tag of purchasing new equipment. A new fire engine exceeds $500,000 and often encroaches on $800,000, depending on additional options selected and required safety features and electronics built into new apparatus. To reduce maintenance costs and capital outlay for equipment purchases, WFD and Clinton Township have begun using the refurbishment process to extend the service life of fire apparatus. The apparatus has to meet requirements addressed by the National Fire Protection Association to ensure a safe and effective public safety vehicle is on the road. Of many considerations for refurbishing vehicles, safety of the drivers, firefighters, and public is primary. Mechanical systems such as brakes, transmission, pump, frame rails, and passenger compartments are areas addressed by the NFPA. 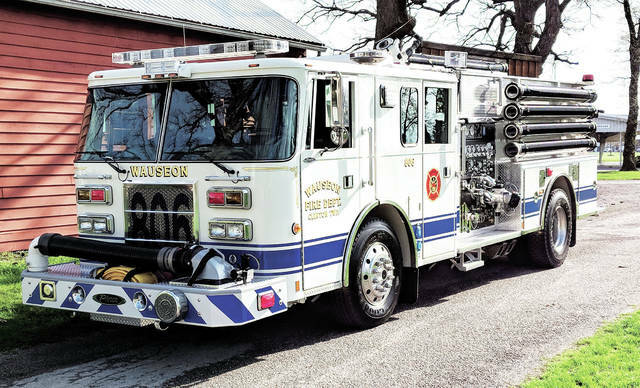 In 2016, the WFD considered the best way to update a 1988 Spartan, 1500 GPM pumper. It lacked proper safety equipment, the pump was failing due to an unavailability of repair parts, and the steel body and water tank were corroding. Decommissioning the vehicle was considered, but the drive train was solid and the Detroit Diesel engine and Allison automatic transmission had been serviced religiously. Mileage is an almost useless measure of value on fire vehicles; they spend hours idling without the pump or transmission engaged. Idling is harder on a motor than highway speed. Additionally, the type of mileage driven is different under various circumstances. The 1988 Spartan pumper had less than 20,000 miles; however, the maintenance cost and condition of major components was a key factor in replacing the vehicle. Age also played a factor in the decision process, but the variables affecting value were too great to make a decision on one factor. And new doesn’t always mean better when shopping for fire apparatus replacement. New Environmental Protection Agency engine requirements since 2011 mean maintenance issues with sensors, computer-related diagnostics, and push-button controls. In the end, the decision was made to keep the original engine, transmission, and possibly the frame and axles, and refurbish or construct a new piece of apparatus based on current needs. Fire apparatus manufacturers no longer made truck cabs that fit over the 1988 vehicle’s power train configuration. WFD searched for reusable apparatus to fit the need, and found a 1993 Pierce fire truck in Blue Ash, Ohio. The truck drew attention because its cab and chassis design could accommodate the 1988 vehicle’s engine and transmission, and its body and chassis were in impeccable condition. The acquisition suited WFD needs and saved a significant amount of money. Following acquisition of the 1993 truck a full review and estimate was completed on equipment planned for combining the trucks into one re-purposed fire apparatus. The original manufacturer, Pierce Manufacturing of Appleton, Wisc., was contracted, and work began in the summer of 2017. That September, the 1993 Pierce was driven to Wisconsin by WFD members of the Wauseon Fire Department, who spent a day at the Pierce shop meeting with mechanical service personnel to discuss the refurbishment. Along the way, both Pierce and WFD made recommendations. Just more than six months after delivering the 1993 Pierce chassis to Wisconsin, WFD received a refurbished and re-purposed fire engine designed to the department’s specifications. Each fire truck has a distinct purpose. WFD has different types of fire, building construction, and water supply concerns within the area it covers. A large majority of structure fire responses are concentrated in rural areas, where no pressurized hydrant supply is available. Different types of water supply equipment are needed to satisfy fire flow requirements. The insurance rates Fulton County citizens pay on residential and commercial property are based on an Insurance Services Office (ISO) rating most insurance companies use to determine the rates each customer is charged. Water supply accounts for 40 percent of a fire department’s classification rating. That portion was formerly based strictly on the distance to a pressurized water source –fire hydrant – with less than a mile in distance to the optimal situation. In recent years, ISO has focused on a fire department’s ability to deliver needed fire flow to a structure. That’s where a rural water supply engine makes a difference. The equipment and appliance set-up on the refurbished apparatus is directly designed to flow rural water on the fire, at an established rate, and faster. The vehicle is equipped with large drafting hose for ponds and dry hydrants, and has over 2,500 feet of supply hose for extended rural hitch and conventional hose lays. Since delivery of the refurbished vehicle, WFD has used it on two major rural fires, proving it invaluable for maintaining the required fire flow needed for each incident. The engine is also dispatched whenever an aerial tower is needed on mutual aid calls with other jurisdictions. The engine allows for extra hose and pumping capabilities often needed on large-volume fires and for first response apparatus to remain in service and available to Wauseon. The refurbished apparatus is a regular part of the Fulton County tanker task force, a mutual aid agreement with surrounding area fire departments to dispatch tankers with one call when needed at rural fires. The agreement eliminates the need for a responding fire department to determine and coordinate the closest surrounding water supply vehicles. Fire departments are dispatched accordingly by the Fulton County 911 center. The goal of WFD is continuous improvement of service delivery to citizens and visitors, but that comes at a cost. The fire department is tasked with dynamic and comprehensive duties, and the community must make complex decisions about the planning and delivery of emergency services. The refurbishing and re-purposing of a fire engine provides two-thirds the life cycle for less than half the cost of new equipment. In 2017, WFD had a 10-year-old ambulance body placed on a new Chevrolet chassis. The process saved Fulton County taxpayers tens of thousands of dollars and provided a reliable ambulance at half of the cost of new equipment. At some point, WFD will have to purchase new equipment. For now, the department has plans to refurbish a 1998 engine, and the department’s ladder truck around 2025. The community’s needs are considered before making decisions about large capital expenditures, and due to unexpected changes WFD forecasting has to remain flexible. Presently, vehicle acquisition will focus on smaller, service type vehicles, such as multi-use quick response trucks used more frequently and staffed with fewer people. This allows WFD to spread coverage and reduce the time needed to provide a professional response to emergencies. https://www.fcnews.org/wp-content/uploads/sites/45/2019/04/web1_repurposed-fire-truck.jpgRe-purposed Wauseon Fire Department 1988 Spartan fire truck. Article drafted from submission by Wauseon Fire Chief Rick Sluder.